The Mediterranean diet is delicious, easy to follow and has long been recommended for its health benefits. People sometimes refer to the ‘Mediterranean Diet’ as though there were just one. The term ‘Mediterranean Diet’ reflects food patterns which have evolved around the Mediterranean Sea, where adult life expectancy is among the highest in the world. 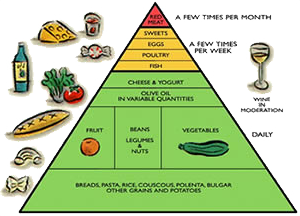 There are many variants of the Mediterranean Diet, of which two are perhaps the best recognized; The Italian variant is relatively low in total fat, with a moderate intake of Olive Oil, fruit and vegetables and a high intake of cereals, while the Greek variant is higher in total fat consumption, but lower in cereal intake. Whether these two variants are equal in terms of their health-promoting qualities is not clear, but a great deal of importance has been placed on the fact that Olive Oil is the principal source of cooking fat in these regions. Recent researchers from Europe and the US* has found that the Mediterranean Diet has a beneficial effect on health and longevity: people tend to live longer overall, and death from illnesses such as heart disease and cancer is reduced by up to 33%. The key, it seems, is to enjoy the delicious diet as a way of life, and to make sure you include all the elements to get the benefit. No Mediterranean kitchen is ever without plenty of good quality Olive Oil, the perfect partner for Mediterranean food styles and flavours. As well as being used to dress cooked dishes, salads and vegetables, there is always a bottle handy on the table for flavouring, seasoning and as a delicious dip for fresh crusty bread. The added bonus is Olive Oil’s significant health benefits. Naturally free of salt and rich in monounsaturates and antioxidants – the preferred source of fat -Olive Oil is thought to help protect against heart disease, promote healthy ageing, regulate blood fats and keep the digestive system in good order.